A fruit wholesaler needs a device for weighing, sorting and packing apples into trays. Each tray shall have the same predefined weight. It is important that the device is absolutely reliable when used continuously in the harvest season. As the food is perishable, large quantities of goods must be processed in the shortest possible time. For this task, the digital PCI-Express board APCIe-1532 is integrated into the device and connected to a digital scale. The scale forwards the weighing data through the digital inputs to the board where data is calculated and classified into weight categories. 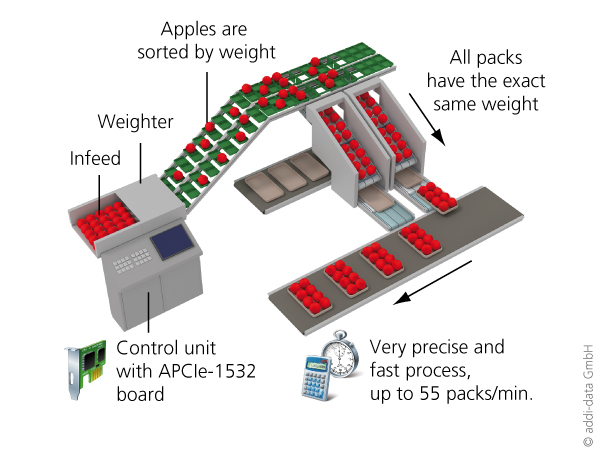 Through the digital outputs, the board controls the sorting of the apples via treadmill into the appropriate tray, so that each tray has the same weight at the end of the process. As soon as the tray has the correct weight, it is packed. The APCIe-1532 allows fast cycles, thus the processing of up to 55 trays per minute is possible. Furthermore, the board comes with numerous protective circuits. This guarantees a high interference-resistance and reliability.